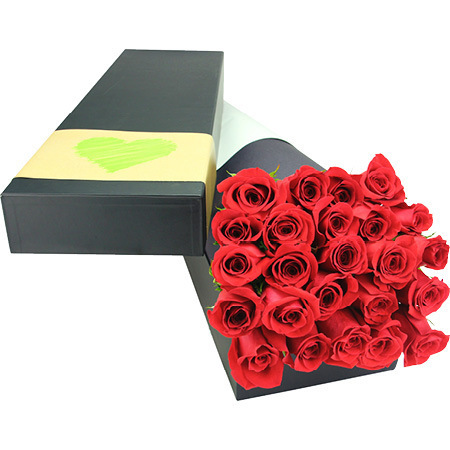 If you really want to make a statement of grand, momentous, stupendous love, 24 red roses with long, 50cm length stems, presented in our stylish signature Flowers for Everyone rose box should do the trick! Beautifully presented, our luxurious gift is the ultimate in Valentine`s Day romance and packs maximum wow factor. This will have your special sweetheart buzzing for days afterwards and everyone else left with serious rose envy! We are now taking orders for this beautiful Valentines rose box delivered Sydney-wide. Send 24 Colombian red roses for Valentine`s Day Thursday 14 February by ordering online, calling our consultants on 1800 66 66 46 or emailing sales@flowersforeveryone.com.au Want to amp up the level of romance a few more notches? You will also find our website offers a variety of gorgeous gift combinations including long stem Colombian red roses with chocolate truffles, bottles of sparkling wine and super cute teddy bears. Please Note: Due to delivery volume on Valentine`s Day, no changes to orders can be made after 18:00 AEST Thursday 7th February for Thursday 14th deliveries. It is also important to note we are unable to guarantee specific delivery times on Valentine`s Day - roses will be delivered anytime between 7 - 5.00pm (business addresses) and 7 - 7pm (residential addresses). No re-directs will be possible if the recipient has left the delivery address for the day, however we will try, where at all possible, to accommodate your needs if this situation does arise. We thank you in advance for your understanding! 2019-02-18 Very beautiful arrangement however flowers died the day after. I was home the whole day and made a request for the delivery guy to knock and the box was left outside in the sun. very disappointed to pay this price and have dead flowers but besides that it was nicely presented. Photo taken the day after, flowers where in a cool room. 2018-11-22 Service rating : Flowers were nice. They are starting to die now. Didn’t last to long. Also we never received the bag as promised. Product : The flowers are already dying. Also the bag as promised we never received.